We’re having our second rounds of video game tournaments! On Wednesday, April 3rd at 6pm we’ll be racing to the finish line in Mario Kart. On Wednesday, May 1st at 6pm we’ll battle it out in Super Smash Bros. Previous participation in tournaments is not necessary. Gr. 5-12. Registration required. Welcome to the New Year! This month we’ll be hosting a ton of teen programs, including: a Mario Kart Tournament, a College Essay Class, the monthly Cooking Club, and more! Some programs require advanced registration. Please check the calendar for more information. In honor of one of the most important figure in comic book history, we’ve created a Stan Lee display with a selection of some of our favorite teen and adult Marvel comics. Check out the display to see the inspiration behind some of your favorite superhero movies, and don’t forget to check out the other Marvel comics and DVDs at SPPL. Stop by after trick-or-treating on Wednesday, October 31st for our second annual Halloween Party! We’ll have pizza, drinks, a costume contest, and watch Hocus Pocus. Registration is required and will begin on Monday, October 22nd. For grades 5-12. 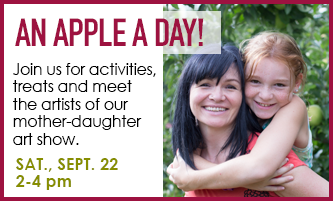 Grab the kiddos and join us for a special apple celebration. Artist and author Leeza Hernandez and her 11-year-old daughter Liv share their favorite pieces from what began as a simple mother-daughter activity and quickly turned into a 100-day art project. The local duo will give their personal take on how they survived the project without driving each other nuts—and will show you and your kids how to make apple prints together. Plus there will be some festive apple-y snacks to enjoy and a special gift to take away. In June 2016, the challenge was to each create an image of an apple using a different medium every day for as long as they felt like it. From edible art to working with paints, pencil, fiber, aluminum foil and even Lego, the duo discovered a myriad of ways you can make multiple interpretations of one single subject. “We agreed to just keep going and didn’t commit to any timeframe which eliminated any pressure about deadlines and the need to have to create,” Hernandez says, expecting patience to get the better of them within the first few days but was surprised at the result. The project was spent during most of summer break and only ended due to back to school and extra curricular time constraints. On average, daily activities ranged from 10 minutes to an hour, while more involved practices were saved for weekends. “It was hard to stop at all, but Day 100 felt like a good place,” Hernandez adds. “The majority of the project was spent working side-by-side discussing our observations, critiquing and comparing notes along the way, but we worked on the same apple together for the 100th. Making apples manifested into special memories for both artists that ultimately strengthened their relationship. The project was documented on Instagram (@leezaworks, 2016)—where you can view their art shown side-by-side—as a way to share and inspire other parents looking to spend time with their kids using a creative outlet. You can be a part of the art show too! Stop by the Scotch Plains Library this week and pick up a piece of the giant apple canvas to participate in a community project. All you have to do is create art on one of the mosaic tiles with your child—remember, you have to work together—and return the artwork and completed form no later than September 18. The mosaic will be constructed and unveiled on the day of the event so bring friends and family for the big reveal! The artists have curated their favorite pieces from the project and will be on display for public viewing from 9/22 through 10/12. This Saturday we’ll be having our second YA Coding Class for beginner coders. This course will teach you the basic principles of computing and introduce you to coding using commonly used languages like Scratch, HTML, CSS and Python. This program is for grades 5-12. Registration is required. Click here to register. Check out our teen summer events! Summer reading has officially started! Sign up online or at the library to win prizes for reading throughout the summer. Also check out our calendar for all the the teen summer programs. We’ll have events every Monday and every other Wednesday, as well as some special programming like a Super Smash Bros tournament and a Harry Potter escape room! For students entering 6th-12th grade. The teen summer reading program begins on Friday, June 1st. Teens can register for a Readsquared account and log their hours online. For more information about the program, rules, and prizes, stop by the library! Join us for this month’s YA Cooking Class. We’ll be making summertime smoothies and milkshakes to celebrate the warmer weather. Please note any allergies on the registration form. For grades 5-12.